The Milky Way seen over Roughtor, the second-highest point on Bodmin Moor. Photo by Mike Wilson. 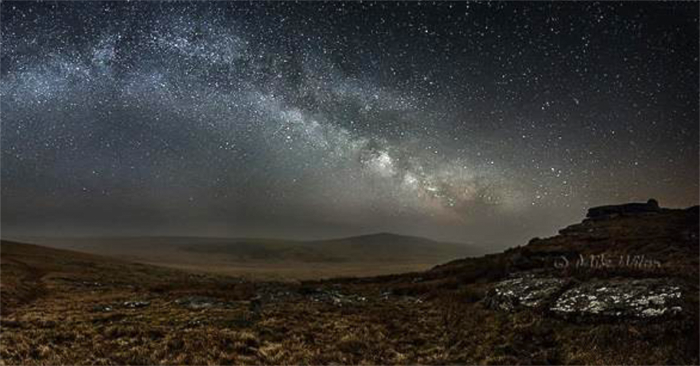 Bodmin Moor has been designated an International Dark Sky Landscape, confirming its status as one of Cornwall’s star attractions and making it the first International Dark Sky Place in an Area of Outstanding Natural Beauty (AONB). Following a bid by Cornwall Council and Caradon Observatory, the International Dark-Sky Association (IDA) has awarded the prestigious designation in recognition of the exceptional quality of the night sky over Bodmin Moor, commitments to avoid light pollution and the provision of educational outreach. Bodmin Moor International Dark Sky Designation covers the portion of the moor within the Cornwall Area of Outstanding Natural Beauty plus a two-mile buffer zone around it. As an AONB, Bodmin Moor is one of the UK’s most cherished and outstanding working landscapes. Its Dark Sky status is expected to boost tourism and the local economy, especially in the darker spring, autumn and winter months when star gazing opportunities are at their best. The designation will also bring health benefits for both people and wildlife in the moor’s living landscape by helping to keep artificial light at a very low level. Within the designation area residents and businesses will be encouraged to protect the night sky from light pollution by managing their lighting better. No one will have to change their existing lights. Instead people will be provided with a guide for dark sky friendly lighting to help them choose appropriate lights when they need to replace old lights or fit new ones. They will also be encouraged to only use lighting where it’s needed and turn off lights when they aren’t needed.